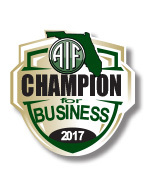 Tallahassee, Fla. – The Associated Industries of Florida (AIF) today announced its 2017 ‘Champion for Business’ award recipients. AIF presents “non-voting” awards each year to recognize elected officials whose extraordinary efforts provide model leadership on key legislation for the success of Florida’s business community. Governor Rick Scott is receiving his fourth AIF ‘Champion for Business’ award. AIF applauds Governor Scott for his committed work on maintaining Florida’s economic incentive pro­grams, such as Enterprise Florida and VISIT FLORIDA. During this year’s regular session, the threat to defund these two agencies was imminent. As Enterprise Florida and VISIT FLORIDA con­tribute immensely to growing our economy, it is imperative that they continue to cultivate a competitive and innovative business environment that maximizes revenues and further creates jobs in Florida. In the final days of a special session, Governor Scott stood firm to guarantee that these two economy-boosting agencies remain intact. Senator Keith Perry (R-Gainesville) is receiving his first AIF ‘Champion for Business’ award. AIF salutes Senator Perry for ensuring the protection of personal identification and private information of a deceased or injured worker from public record when employees file a workers’ compensation claim. Protecting the private information of Florida’s employees is one step in the right direction to fixing the workers’ compensation system in Florida. HB 1107 passed both legislative chambers and is waiting to be signed into law by Governor Scott. Senator Kelli Stargel (R-Lakeland) is receiving her first AIF ‘Champion for Business’ award. AIF commends Senator Stargel for her advocacy in reducing taxes for Florida’s families and businesses. While working with the sponsor in the House, Senator Stargel was able to secure $180 million in tax cuts for the 2017-2018 Fiscal Year. Each year, Floridians rely on these tax cuts for relief, whether it be in the form of incrementally decreasing the business rent tax or a 10-day back-to-school tax holiday for clothing, footwear, school supplies and computers. HB 7109 was signed into law by Governor Scott and will take effect on July 1, 2017. Representative Ben Albritton (R-Bartow) is receiving his first AIF ‘Champion for Business’ award. AIF hails Representative Albritton for securing the protection of personal identification and private information of a deceased or injured worker from public record when employees file a workers’ compensation claim. Protecting the private information of Florida’s employees is one step in the right direction to fixing the workers’ compensation system in Florida. This legislation passed both legislative chambers and is waiting to be signed into law by Governor Scott. Representative Jim Boyd (R-Bradenton) is receiving his fourth AIF ‘Champion for Business’ award. AIF salutes Representative Boyd for his leader­ship in reducing taxes for Florida’s families and businesses. His sponsorship and steadfast work on this legislation will promote and solidify Florida’s standing as one of the best states in which to live and conduct business. Representative Boyd’s successful work on this year’s tax package, HB 7109, will amount to $180 million in cuts for the 2017-2018 Fiscal Year. Governor Scott signed HB 7109 into law and the bill will take effect on July 1, 2017. Representative Jay Fant (R-Jacksonville) is receiving his first AIF ‘Champion for Business’ award. AIF commends Representative Fant for his effort in finding a solution to Florida’s current unconstitutional workers’ compensation system. Although he did not sponsor the full workers’ compensation legislation, Representative Fant fought hard for his amendment to the full House bill (HB 7085) that would have moved Florida to a claimant paid system. This amendment would have put Florida in line with 32 other states and had the united support of the business community. Representative Danny Burgess (R-Zephyrhills) is receiving his first AIF ‘Champion for Business’ award. AIF recognizes Representative Burgess for his tireless and unwavering work in the House to address the issues within Florida’s workers’ compensation system that have deemed the system unconstitutional. Representative Burgess offered legislation that focused on stabilizing the continuous increase in the cost of workers’ compensation on Florida employers, ensuring employees get the care they need to return to work, and creating a self-executing system fair to all. The ‘Champion for Business’ award symbolizes AIF’s gratitude for extraordinary efforts by elected officials on behalf of Florida’s business community. Since 2003, AIF has given a total of 209 ‘Champions for Business’ awards to 93 different elected officials. To view the full 2017 “Champion for Business’ publication, please visit http://bit.ly/2thOSoP.